The application of molecular genetics to the field of DMSP research has hugely expanded our knowledge of the mechanisms by which many marine bacteria and some fungi generate the important gases DMS and methanethiol. Our studies have found there is a remarkable diversity in the ways in which different microbes can generate DMS, from DMSP through the enzyme products of the ddd genes; or from an alternative pathway such as our most recent discovery, from methanethiol. We are also interested in how DMSP and other osmoprotectants are produced by diatoms and the role they play within the cells. Our other main running research theme in the lab revolves around how microbes, both marine and terrestrial, acquire and regulate the acquisition of essential transition metals, such as iron and manganese, from their environment. DMSP catabolism. 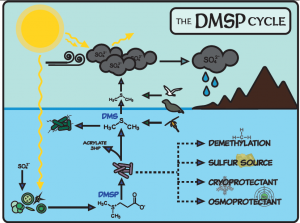 Identification and characterisation of the ways in which microbes breakdown the anti-stress molecule dimethylsulfoniopropionate (DMSP) that is made by many marine phytoplankton, macroalgae, a few angiosperms and some corals. How and why do Eukaryotic Algae make DMSP and glycine betaine? Identification of the ways which algae make the most abundant osmoprotectants in the nature. Metal transport and regulation. Studies of mechanisms involved in metal transport and metal responsive gene regulation in Rhizobium and marine proteobacteria. Carbon Monoxide Dehydrogenase Enzymes. Analysis of CMD enzymes in marine Roseobacters that serve to detoxify this respiratory inhibitor. Carrion O, Curson AR, Kumaresan D, Fu Y, Lang AS, Mercade E & Todd JD. A novel pathway producing dimethylsulphide in bacteria is widespread in soil environments. Nat Commun. 2015 Mar;6:6579. doi: 10.1038/ncomms7579. Curson AR, Burns OJ, Voget S, Daniel R, Todd JD, McInnis K, Wexler M, Johnston AW. Screening of metagenomic and genomic libraries reveals three classes of bacterial enzymes that overcome the toxicity of acrylate. PLoS One. 2014 May 21;9(5):e97660. doi: 10.1371/journal.pone.0097660. Green RT, Todd JD, Johnston AW. Manganese uptake in marine bacteria; the novel MntX transporter is widespread in Roseobacters, Vibrios, Alteromonadales and the SAR11 and SAR116 clades. ISME J. 2013 Mar;7(3):581-91. doi: 10.1038/ismej.2012.140. Curson AR, Sullivan MJ, Todd JD, Johnston AW. DddY, a periplasmic dimethylsulfoniopropionate lyase found in taxonomically diverse species of Proteobacteria. ISME J. 2011 Jul;5(7):1191-200. doi: 10.1038/ismej.2010.203. White GF, Singleton C, Todd JD, Cheesman MR, Johnston AW, Le Brun NE. Heme binding to the second, lower-affinity site of the global iron regulator Irr from Rhizobium leguminosarum promotes oligomerization. FEBS J. 2011 Jun;278(12):2011-21. doi: 10.1111/j.1742-4658.2011.08117.x. Singleton C, White GF, Todd JD, Marritt SJ, Cheesman MR, Johnston AW, Le Brun NE. Heme-responsive DNA binding by the global iron regulator Irr from Rhizobium leguminosarum. J Biol Chem. 2010 May 21;285(21):16023-31. doi: 10.1074/jbc.M109.067215. Todd JD, Curson AR, Nikolaidou-Katsaraidou N, Brearley CA, Watmough NJ, Chan Y, Page PC, Sun L, Johnston AW. Molecular dissection of bacterial acrylate catabolism–unexpected links with dimethylsulfoniopropionate catabolism and dimethyl sulfide production. Environ Microbiol. 2010 Feb;12(2):327-43. doi: 10.1111/j.1462-2920.2009.02071.x.